The French philosopher Francois Voltaire once said, “Man is free at the moment he wishes to be.” This statement can be applied to the many citizens of Cuba who fled their homeland, to capture their own freedom. 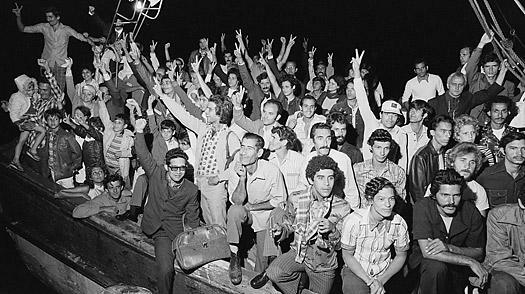 The history of Cuban immigration varies throughout time periods. There are many reasons why and how Cuban people immigrated to the United States as well as the immigration laws created to help acclimate them as US citizens. Reaching the United States is highly sought after for many Cubans seeking political freedom. Cubans live in a country having a communist government and is ruled by a dictator. Cuba was governed by Fidel Castro, but now Raul Castro is the dictator. Many also wish to leave Cuba because there is more opportunity given to the individual as well as the idea of capitalism incorporated into society. These traits are very favorable to many who would like to immigrate as life in Cuba does not present such qualities. Also, life in the United States allows it's citizens to have basic rights that are deserved to each person. Peoples living in the United States have freedoms of speech and to assemble. These rights are severely limited- basically nonexistent living in Cuba. If a person tries to reclaim these freedoms in Cuba and speak out or assemble to conspire against the government, they would be put in much danger, and their lives may even be at risk. Lastly, many Cubans find immigrating to the United States desirable to be with their families, as many separate in order to capture their freedom. Families split up to immigrate and so many wish to also to reunite with their families. (Cuban Immigration). There are many reasons why Cuban people immigrate to the United States, all of which include the need to have a better life and future. Cubans immigrate to the United States in a variety of ways. Due to political upheaval, many Cubans have found immigrating to the United States to be very desirable. After Fidel Castro came to power in 1959, and began allying the country with the Soviet Union, many Cubans became worried that their children would be forcefully sent to the Soviet and be educated in the ways of communism. So, in their fear, many parents sent their children to America. In total, over 14,000 Cuban children immigrated alone to the United States. When they arrived in Miami, the children lived in foster homes, boarding schools, orphanages, or to live with relatives already in the country. Together, this successful program is known as Operation Pedro Pan or Operation Peter Pan. (How Cubans Come). Many Cubans come to the United States illegally, smuggled, by boat. Although this is illegal, immigrants can have a chance of becoming American citizens. This is done through the “wet-foot, dry-foot policy,” formally called the U.S.-Cuba Immigration Accord and was written into the 1966 Cuban Adjustment Act. This policy allows those who reach American soil to, after one year, apply for an immigration visa and later, U.S. Citizenship. Those who are intercepted at sea, are either sent back to Cuba or to another third country. This allows for immigrants to escape Cuba, while controlling and limiting the number of migrants arriving in the U.S. (Morley). There are many laws and accommodations for incoming Cuban immigrants. The most famous of which, as was mentioned previously, is the Cuban Adjustment Act of 1966. This act allows immigrants to become citizens of the United States exactly one year after they entered the country. All Cubans entering the country must first be paroled in order for them to officially become citizens after that year has taken place. This allows many who are immigrating to arrive at any port, or in general, any piece of land other than one that is normally used as a port of entry, to still eventually become a citizen. (Cuban Natives). These immigrants are treated as political refugees and so are allowed benefits that most immigrants from other countries cannot receive, like a permanent residence, medical benefits, like insurance, are able to legally work, unemployment benefits, and welfare. (The Cuban Adjustment). Clearly, with such laws and other benefits granted to Cuban immigrants, coming to the United States is very advantageous and full of valuable resources. Elian Gonzalez is a Cuban boy who escaped from Cuba in November of 1999 with his mother, who drowned in the journey. Elian was found in an inner tube by local fisherman who turned him over to the U.S. Coast Guard. He was placed into the care of his great-uncle by the U.S. Immigration and Naturalization Service. Custody and battles over his citizenship later ensued and Elian was deported back to Cuba in 2000 to be with his father. As of the 2000 census count of peoples living in the United States, over one million Cubans are living in America. (Number). It is obvious to see from this number that many left the country of Cuba and immigrated to the United States in hopes of a better future. Those who immigrated left their homeland for many reasons and by many different ways. Coming to live in a new country, full of promise and opportunity only enhanced by the benefits of the laws directed towards Cuban immigrants, is sure to have played a role on the decision made by many to immigrate. Cuban immigrants, just like American citizens, only want to have rights, liberties, and freedoms; which they are sure to receive while living in the United States.